Today is Thursday, February 9, the 40th day of 2017 in the Gregorian calendar, with 325 days remaining. 1,441 days until the end of Donald Trump's term as President, assuming he isn't impeached. 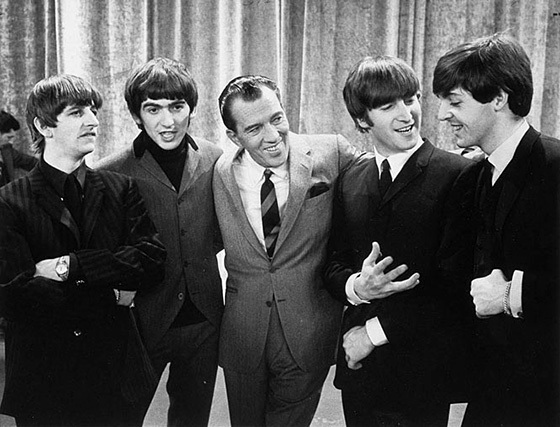 On this date in 1964, over 73 million Americans, or roughly 40% of the population of the entire country, gathered around television sets to watch the Beatles perform on The Ed Sullivan Show. Among other things, today is also National Pizza Day and National Bagel Day. Celebrate both- have a pizza bagel! Florida man caught trying to steal $7 billion, blames Jesus. Alice Walker (1944), American novelist (The Color Purple), short story writer, poet, and activist. "It is the duty of a patriot to protect his country from its government." A full moon, lunar eclipse, and comet all in one night. Here's how to watch it Friday. Archaeologists may have discovered another Dead Sea Scrolls cave. A team from the Hebrew University of Jerusalem and Liberty University in Virginia have discovered what they believe to be a 12th cave on the cliffs west of Qumran. In addition to Biblical text, the scrolls contain hymns, prayers, commentaries, and mystical formulas. They're so valuable that a fragment of an original scroll the size of a fingernail can cost up to $1 million. President Trump has begun reaching out to veterans of earlier White Houses for advice, as he seeks to bring more order and stability to a chaotic internal power structure that relies on competing and sometimes conflicting centers of gravity. Wrong-way Trump... FBI reports show far more terror suspects coming from Canada. "We are looking the wrong direction," said a senior DHS official familiar with the data. "Not to say that Mexico isn’t a problem, but the real bad guys aren’t coming from there—at least not yet." It's not foreigners who are plotting here: what the data really shows... more than 76 percent of individuals arrested by the FBI over the past two years for terrorism-related offenses were U.S. citizens as a result of having been born in the United States. Have a project commitment due tomorrow. See you Monday. Have a great weekend!